Glendale Police Sgt. David Vidaure said the 51-year-old homeowner confronted 23-year-old Benny Garcia as he was trying to get in. Vidaure said a fight ensued and the homeowner shot Garcia who was later pronounced dead at a local hospital. According to TPD Sgt. Dedlorn Sanders, while the suspects began gathering up the woman's belongings, she produced a gun to defend herself. Sanders said the male suspect tried to wrangle the gun away from her, and she accidentally shot herself in the hand during the struggle. There is an interesting court case proceeding in Massachusetts. 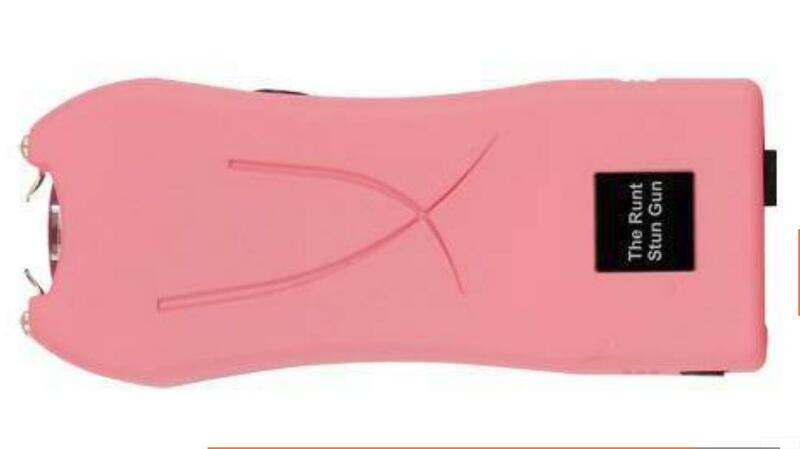 A homeless woman was given a stun gun for defensive purposes. She used it to defend herself against domestic abuse. She was arrested for shoplifting, and the police found the stun gun, which is banned in Massachusetts, one of only five states to do so. In her defense, her public defender is claiming her second amendment rights cover the stun gun. In a legal brief, prosecutors argue that the Second Amendment does not establish a constitutional right to own a stun gun and that two pivotal U.S. Supreme Court decisions that upheld the right to own a firearm for self-defense inside homes did not automatically grant that right outside the home. Do you think stun guns should be covered under the second amendment? Yes is at 80%; No is at 20%. Here is a link to the poll. It is at the bottom of the article. An important question before the court is if being without a home deprives a person of their constitutional right to keep and bear arms. Numerous courts have already ruled that being homeless may not deprive a person of the right to vote. NOLANVILLE (November 26, 2014) A shooting early Wednesday after a night of drinking and dominoes at a rural home outside of Belton that left a 47-year-old man dead was evidently self-defense, authorities say. Detective Craig Starr says 61-year-old Terah Frost fatally shot Grimes after finding his 59-year-old brother, Barry Frost, fighting downstairs with Grimes, who was wearing a mask and was armed with a knife. The homeowner, a 33 year-old woman, had armed herself as she heard the suspect repeatedly pounding on the front door, police said. As the homeowner came to the front door, the suspect, a 22 year-old man unknown to the residents, started to force his way inside the house. The homeowner and suspect struggled at the front door, police said, and then the homeowner reportedly fired one shot, striking the suspect in the abdomen, police said. The sheriff’s office said the owner went to call police on Smith, when Smith dove into his truck and grabbed what appeared to be a gun case. The owner then shot Smith in the arm. But there was no gun inside the case—only a needle, spoon, and syringe. "Well, he had to protect himself and he didn't know what the guy was reaching for. It's hard to say what you'll do till’ you're in that situation," Morgan said. "There were three wheels left, and I told Brad to get his gun and not to go to work because I knew (the thief) was coming back," said Tina Russell, Brad Russell's wife. Tina Russell was apparently right. Police said Bradley Russell saw the same Forerunner driving past about 15 minutes later. He stopped into the street, pointed the shotgun at the vehicle and yelled for the driver to stop. 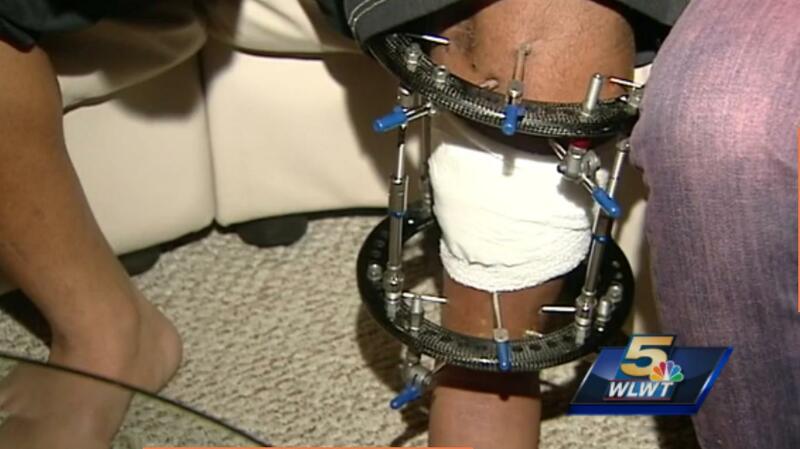 Instead, the driver tried to go around Bradley Russell, and the vehicle struck him in the knee. Bradley Russell fired one shot at the Forerunner, hitting the rear and driver's side, the Sheriff's Office said. According to Students for Concealed Carry (SCC) at Florida State, two students present at the shooting that occurred on 20 November could have stopped the shooting but were disarmed by the current Florida law. This is highlighted by two FSU students, one of whom was a US Army Infantry combat veteran and had a clear shot at the shooter, the other is gunshot victime Nathan Scott who is a member of Students for Concealed Carry at FSU who was able to go and warn other students about the shooter despite his injury. Both of these individuals, in spite of having the training and skills necessary to end the shooting, were powerless to prevent it due to Florida's laws. This helps explain why the poll taken in Florida after the shooting was so completely onesided. It was 15-1 in favor of more freedom on campus. Earlier this week, I climbed a mountain. It is a locally popular way for people to get some exercise and a nice view. As usual, I was openly carrying a Glock 17. I carry primarily for political purposes, so I wore a "Gun Guy" hat given to me by Dan Baum at the Shot Show a couple of years ago. Another reason is that it can get windy on the mountain, and I have had broader brimmed hats blown off. As I arrived at the top, a pair of young ladies asked me to take their picture, to commemorate their climb, and likely spread the event about on facebook, twitter, and other social media. I had just received a phone call, so I excused myself to my brother on the other end, and attended to the ladies needs. I took their picture with their phone, and told them that I was a blogger who wrote about guns. The immediate response was noteworthy: Awesome! and Cool! Then one said that the first time she had shot a gun was in Arizona, but that she was from Pennsylvania. It is a little known fact that Yuma's population triples in the wintertime with winter visitors and tourists. I mentioned that Pennsylvania had fairly decent gun laws as well; open carry without any license and an easy to obtain concealed carry permit, for example. She said well, yes, but it just does not compare to Arizona. I gave the beaming young women copies of my card, with which they seemed well pleased; bid them goodbye, and started down the mountain. Now, of course, I wish that I had taken their picture with *my* camera! 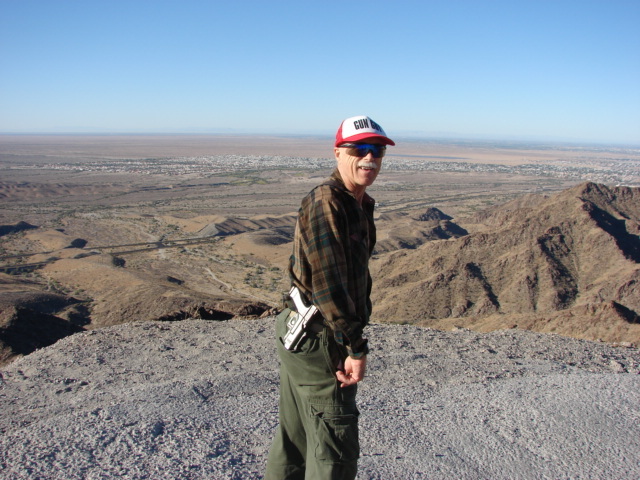 It says a great deal about the growth of the gun culture, when pretty young ladies, out to obtain some exercise, fresh air, and nice views, see an older gun blogger as a positive and noteworthy figure. Perhaps the ladies were merely being polite, but their enthusiasm was contagious. They did not appear to be competitive shooters, but they were enthusiastic about the idea of shooting, and of having the right to do so. I suspect that we will attract more of them to Arizona, and grow more in Pennsylvania. It seems to be happening. Women are the fastest growing group of competitive shooters and concealed carry permit holders. 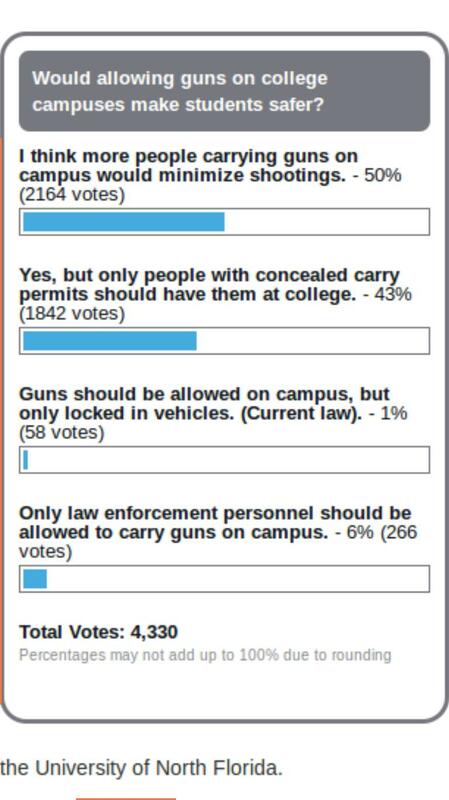 The article with this poll was first published on Friday afternoon a week ago, 21 November, 2014, the day after the shooting at Florida State University (FSU). I wrote about it the next day. At that time the ratio of second amendment supporters to disarmists was a very high 12 to 1. On Saturday morning, about 6 a.m. the total number of votes cast were 2740. As you can see from the screenshot, today, 28 November about 10 a.m., the number has increased to 4,330, and the ratio has increase from 12 to 1 to an astonishing 15-1! The poll below is closer to what we commonly see. It was done in a Michigan publication. Most second amendment related polls result in ratios from 3-10 to 1. The result of this poll falls well within the "normal" range, at 4-1. Online polls essentially measure an "intensity ratio". That is, the ratio of those who are motivated enough to answer an online poll, one way or another. Why is the ratio in the Michigan poll so much lower than that in the Florida poll? Both polls address second amendment related issues, but the questions asked are much different, and the responses offered are significantly different as well. The question in the Michigan poll is a simple emotional one about "feelings". It is not a policy decision. It does not ask anything about law or firearms policy. It only lists two responses, yes and no. 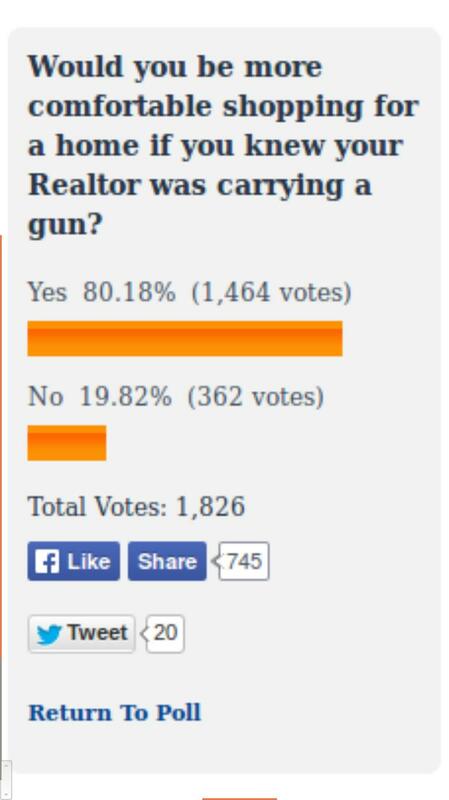 In the Michigan article preceding the poll, significantly more space is devoted to people who "feel" uncomfortable with a Realtor carrying a gun than people who approve of such action. In the Florida Poll, the question is all about policy and logic, not about emotion. The article preceding the poll gives information about the policy decisions. Most space is given to the attorney for Florida Carry, who outlines the arguments for student carry, while the opposition arguments are given a fraction of the space. The respondents can choose between four policy decisions. Even given the disparity of the space given to opposition arguments, the 15-1 ratio stands out. Does this tell us anything useful? First, a disclaimer. We do not know what audience this poll reached. It is not a scientific poll. It is simply a rough measure of intensity. But taking that into account, the lesson that I gather from the above is that the arguments made in favor of second amendment solutions are highly persuasive, if they are heard. It reinforces what I have observed for several decades. When second amendment supporters are able to get their message to the public, they win. The gun culture debate ignited again this week with the Eurobodalla Shire Council voting to allow the sale of firearms at next year's Narooma HuntFest. Hunters say they are responsible people engaged in a sport that's highly regulated. They say a Green agenda is driving opposition to HuntFest. Opponents of HuntFest say they are concerned about the growth of a gun culture in Australia. The first HuntFest, held over the June long weekend this year, had been approved to operate as a showcase for firearms, information on hunting, and a photographic event. 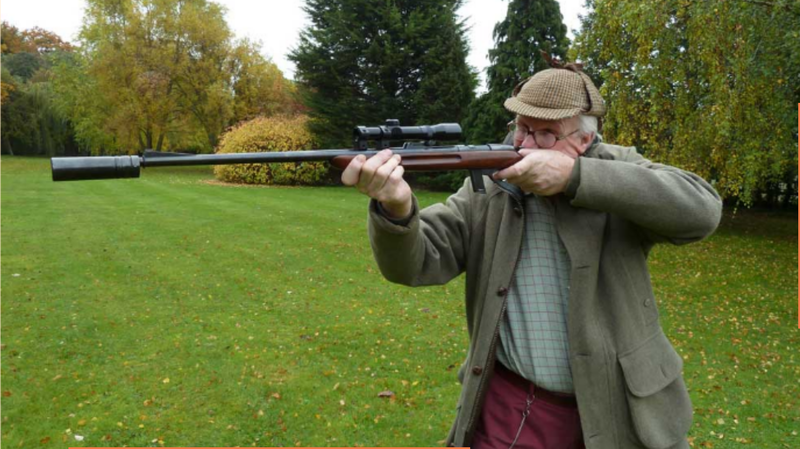 Huntfest organisers had since applied to Council to support an amendment to the festival's Firearms Permit that would allow the sale of firearms the next festival. The application was passed this week (25 November) by a majority of five to two. Eurobodalla Shire Council Deputy Mayor Rob Pollock told ABC Local Radio that "The five [Councillors] that voted for it I think feel very strongly that it was a Council facility involved in legal activity and all the safeguards and necessary permits had been retained and regarded." Cr Pollack pointed to regulations that control the sale and purchase of firearms in New South Wales. "It's not like you just roll up with your Bankcard or your Mastercard and say 'look I'll have that rifle over there' and then you walk out with it in a brown paper bag under your arm," he said. "There are strict procedures regarding licensing, regarding sale, regarding when that particular delivery etc can take place. None of the retail sales if they do occur will actually happen within the opening hours of the HuntFest situation." HuntFest organisers estimate the festival to have attracted about 2300 people and $900,000. A talkback caller to ABC Local Radio, Peter, who said he had been at the Council meeting, said, "What Council has now done is it has enabled the increase of the availability of guns into the community. It's quite extraordinary." The AG’s latest request to the court comes after the court denied the AG’s and several gun ban advocacy groups’ requests to join the case once they learned Sheriff Gore had decided not to appeal the case any further. The anti-gun rights groups have also filed a similar request for en banc review of the Ninth Circuit's denial of their requests to intervene in the case. This is another move by the AG to fight Peruta at every possible turn. I have read the Order Denying Motions to Intervene. Like the rest of the Peruta decisions, the order is clear and logical. But then, I am not a lawyer. It is easy to see why the disarmists are desperate to stop implementation of Peruta. Once Peruta is implemented, hundreds of thousands of California shall issue permits will be issued. Once that many voters, (because virtually every permit holder is a reliable voter) have permits, there is no putting the shall issue genie back in the bottle. California is the last hope for disarmists to achieve a sort of stalemate for the implementation of the second amendment. If they lose Peruta, California and Hawaii are lost. Once California and Hawaii are lost, only a tiny remnant of "may issue" states remain on the East coast, surrounding New York, where the entire sham of modern "may issue" started with the infamous Sullivan law; a law that was designed to protect organized crime. In that situation, national reciprocity will become a fact, if it has not already. It is hard to believe that the citizens of New York will be reconciled to a situation where everyone in the nation who wishes to, will be able to exercise their second amendment rights in New York, *except* for citizens of New York and the other five states in the North East coastal cluster. I think Peruta will stand. The logic is clear, the facts are clear, the Constitution is clear. Much of rural California is already effectively shall issue. But ideologues on the left seems to hate the idea of armed citizens to its core, even though that hatred is irrational and is an enormous political liability. (Reuters) - A north Florida woman facing a retrial on charges of aggravated assault after she said she fired a warning shot at her abusive husband agreed on Monday to plead guilty after her sentence was dramatically reduced. The case of Marissa Alexander, 34, helped inspire a new state law making a warning shot legal in some circumstances, although it was not known if that influenced the plea deal. 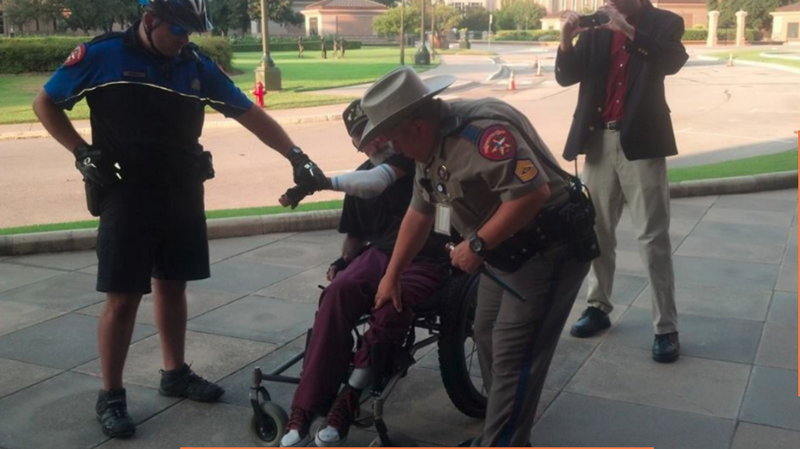 About a year ago, Open Carry Texas held a demonstration at the Texas State Capitol at Austin. Several people were arrested. Charges were slow in coming. 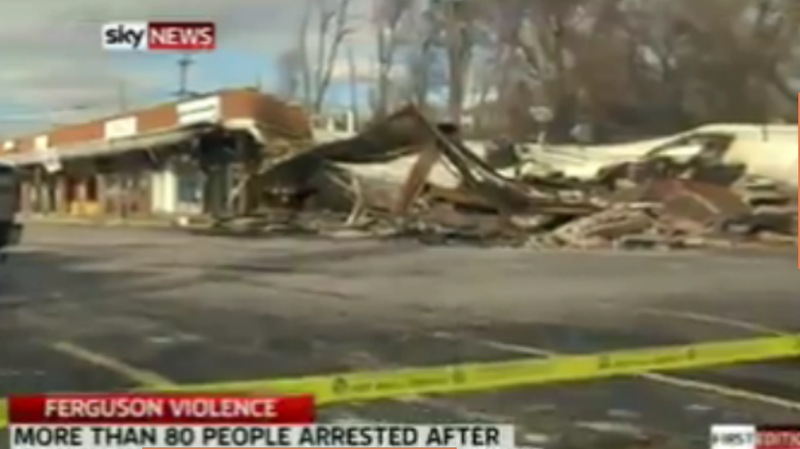 It appeared that they might be charged with the catch-all of "disorderly conduct". The open carriers repeatedly said that they were doing nothing illegal. Very happy to report that, according to CJ of Open Carry Texas (OCT), Texas Law Shield (TLS) was able to get all charges of all those arrested at the Capitol dropped today. This should include several arrests for carrying BP replica revolvers, as well as an arrest for carrying a toy revolver. I'll post more details if they become available. The Texas Republican party included a plank in their platform for this year's election calling for constitutional carry. The platform also included a resolution put a constitutional amendment on the ballot to restore the Texas Constitution's right to bear arms protection to what it was before it was mangled by the reconstruction government after the war between the states, or civil war, if you prefer. In a bizarre decision in Agent Dobyns' case, Judge Frances M. Allegra, voided his own decision in favor of Jay Dobyns. U.S. Court of Federal Claims Judge Francis M. Allegra, who issued a 54-page decision in favor of that ex-agent, Jay Dobyns, in August, voided his decision on Oct. 29, according to a court notice filed Nov. 5. The notice does not outline why Allegra voided his decision. Furthermore, the judge sealed other court documents, shrouding the matter from public view. No one associated with the case is commenting on what the decision means, but there is bound to be speculation comparing the case to Chief Justice Roberts decision to change the finding on Obamacare just days before it was released. Judge Allega had ordered that Eric Holder and other top Department of Justice officials be served with the judgement. Matt Bracken has speculated that the Obama administration uses extortion and blackmail to coerce members of the Judicial and Legislative branches of government to obtain the results that he desires. Park City, Utah, officials were the latest in a series of local governments that have been forced to respect the Constitution by the Second Amendment Foundation (SAF). SAF has run up an impressive number of legal wins to protect second amendment rights. It has become the ACLU of the gun culture. In the Park City case, the city had adopted local laws in direct violation of the second amendment and Utah state preemption law. The city law prohibited all use and possession of firearms; all carrying of concealed weapons; carrying of loaded guns inside a vehicle; showing a gun in an angry or threatening manner (no exceptions for justified use of force); and using a gun in a fight.
" Had the City Council not repealed the sections, the restrictions "would amount to unlawfully restricting an individual's rights under the Second Amendment of the United States Constitution . . . " as well as rights outlined in the Utah Constitution, the report said. The council members were not happy about being required to obey the Constitution. They reluctantly repealed the illegal gun laws on 25 November of 2014. The council members seem quite willing to create law for others to obey. These seem like unusual positions for a rural Utah town of 8,000 people. Perhaps a reader can comment on the local politics. Park City received the letter from SAF in July of this year. It was signed by Alan Gottlieb. According to the police report, Grimes punched the homeowner in the stomach and the two began fighting. The other homeowner heard the dispute and saw Grimes, who was holding a knife, wearing a hooded sweatshirt and a bandana over his face. The homeowner shot Grimes with a handgun. He was pronounced dead at the scene. New Orleans police will not ask for charges against the man who shot a suspected armed robber Friday night in the city's Gentilly neighborhood, an NOPD spokesman said Monday (Nov. 24). The wounded man, identified by police as 22-year-old Samuel Sims, remains hospitalized with a gunshot wound to the chest following the shooting near the intersection of Paris Avenue and Treasure Street. St. Petersburg, Florida -- A dog owner could could be charged with an ordinance violation after her two pit bulls reportedly attacked a neighbor and were shot Monday. As she tried to close the window, she said the dogs jumped at her, biting her hands and wrist. She called out for help and her daughter grabbed a gun and, seeing the dogs attacking her mother, shot them. The dogs ran off back to their yard. This is how CBS News investigative reporter Sharyl Atkisson described the response to a phone call she made to the White House to ask some questions about the Operation Fast And Furious scandal. On the other end of the line was a deputy White House press officer named Eric Schultz. The screaming tantrum was disturbing enough that she put the call on speaker phone in her office at CBS News, so that Schultz’s blistering tirade could be overheard by ear-witnesses. She made repeated calls over many months to Verizon asking for help with her sabotaged phones and computers with no success. When she enlisted the help of trusted former intelligence officers, they found an extra and unneeded fiber-optic line leading from her house to the side of her garage. On New Years Eve 2012, she called Verizon, but they disavowed any knowledge of the extra fiber-optic line, and advised her to contact law enforcement. I actively look for and monitor defensive uses of firearms. 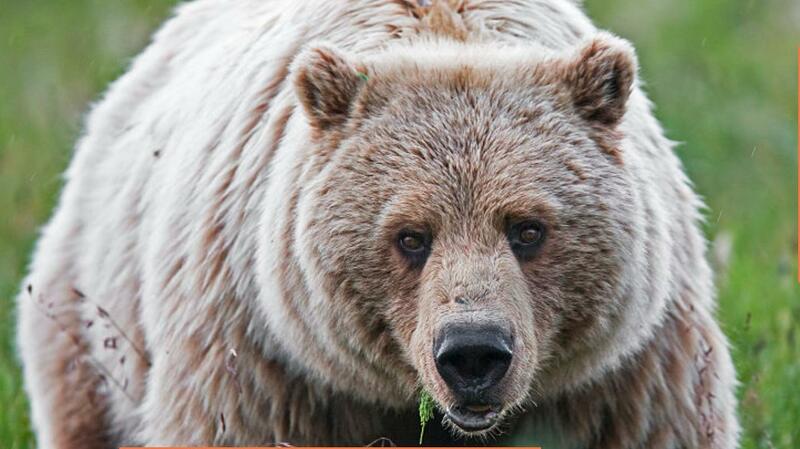 While some defensive uses of firearms are common, such as driving off intruders from a home, others such as defense against a grizzly bear, are rare. They tend to stand out when they happen. I missed this one, even though it did get some coverage in 2013. The actual defense occurred two years ago in November of 2012. CHEYENNE, Wyo. – Federal prosecutors have decided not to file charges against two young elk hunters after investigators concluded they acted in self-defense when they shot and killed a grizzly bear in Grand Teton National Park last fall, park officials announced Thursday. "They complimented the boys on how well they did because the bear was within eight feet of one of them," Dwayne Trembly told The Associated Press. The bear was hit with three bullets. Two were to the head, and the third was to the back. I suspect that the head shots occurred first, and and the shot to the back happened as the bear dropped and slid toward the hunters. It seems unlikely that bear spray would have been sufficient to prevent injury in this incident. I have not seen any description of make, model, or caliber of the firearms used. In the Ninth Circuit federal court of appeals, District Court Judge B. Lynn Winmill ruled that the second amendment does not stop at the boundary of land administered by the Army Corps of Engineers. There are millions of acres of wild land and waters involved, as the Corps of Engineers administers enormous projects across America on the waterways. U.S. District Court Judge Harold Murphy in August ruled against David James and GeorgiaCarry.org, both of whom argue James has the right to carry firearms onto U.S. Army Corps of Engineer-managed land and water at Lake Allatoona, including McKaskey Creek Campground in Cartersville. James and GeorgiaCarry.org appealed to the 11th Circuit Court of Appeals, dismissing Murphy’s ruling that the Corps land is “sensitive,” like a school or government building. They want the appeals court to issue a preliminary injunction and allow James to carry firearms onto Corps property. Many are speculating that the Idaho case settled by Judge Winmill will also be appealed, but it has not yet happened. Both cases appear to assume that there is a right to bear arms outside of the home. In the Georgia case, the ruling uses the "sensitive places" wording in the Heller decision as the excuse for a ban on bearing arms in millions of acres of Corps administered land. It is hard to see that land as being more sensitive than National Park land, on which a ban was removed by law in 2009. Second amendment supporters have been pushing for a similar bill that would nullify the Army Corps of Engineers regulations. With wide support in the Senate and House, passage of such a bill would render the lawsuit in Georgia moot. 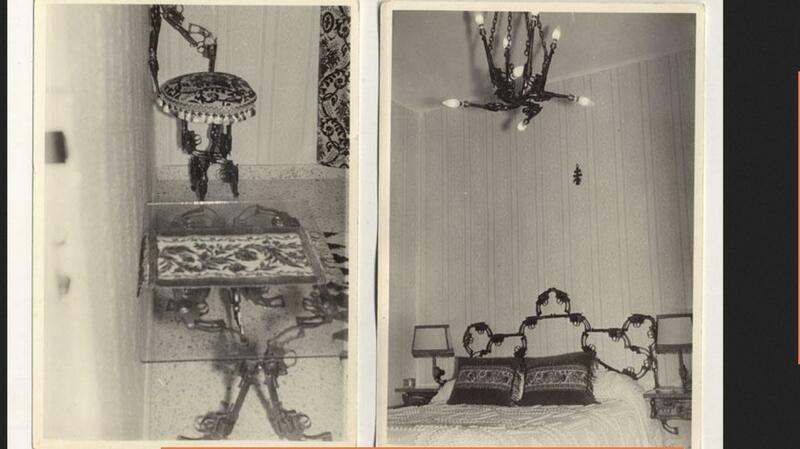 These pictures of a unique bedroom set came to me via the Internet. I do not know the location of the set or the source of the revolvers. Counting the revolvers that make up the bed frame, the vanity, the lamps, table, chair, chandelier, and window decoration, and assuming that there is symmetry on the sides of the objects that are not visible, I believe there are at least 100 revolvers used in the construction of the set. The revolvers are an eclectic mix of Smith & Wesson (or clones) and Colt (or clones) revolvers. They appear to mostly intact. It seems likely that a few dozen working revolvers could be assembled from the frames and parts. 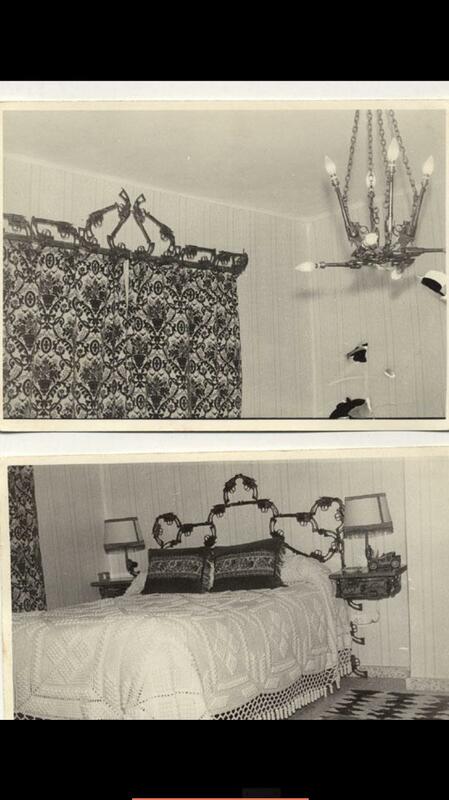 While there are many places that have dozens of revolvers, there may be only one revolver bedroom! The actions do not appear to be welded shut. A good friend who is a small arms expert, and I, examined the pictures as best we could. He believes that the revolvers are pre-WWII. It is certainly possible. All of them appear to be side swing revolvers. I do not see any top breaks, and that makes sense for this sort of construction. A related question is: what was the source of these revolvers? Our best theory is that they were confiscated guns that were required to be "disposed of". A large police department in a city such as New York, Chicago, or Detroit, can confiscate thousands of firearms a year. Perhaps these were confiscated during Prohibition. The set is a unique piece of firearms art that celebrates, rather than vilifies, gun maker skills. 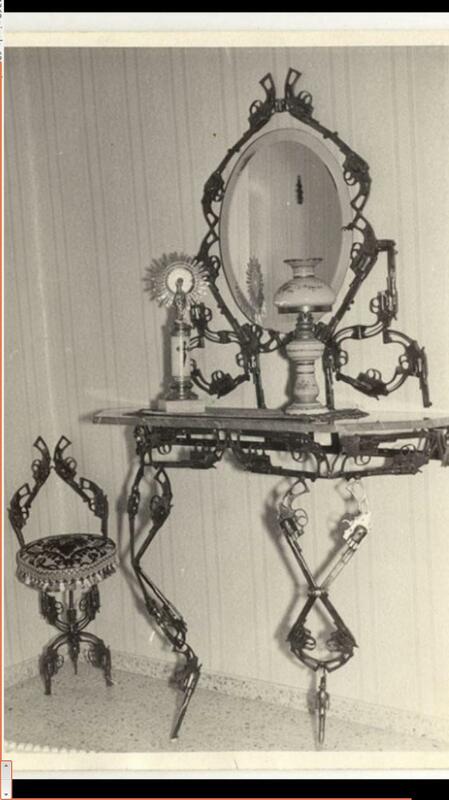 Any additional information about the provenance and location of this set would be appreciated. People outside said a car driven by a black woman with three other people in it sped through the parking lot several times and almost hit bystanders, Stroer said. When the car returned, an employee confronted the driver and fired multiple shots at the car as it drove toward the employee and other people in the parking lot, Stroer said. Witnesses said the driver sped off. TUSCALOOSA, Alabama -- A Tuscaloosa woman opened fire Saturday night on a man previously accused of stalking her after he allegedly came to her house and threatened to kill her. WARREN — A resident of Starlite Drive Northwest shot and killed an 18-year-old Southington man who police believe was part of a group of three people committing an aggravated burglary at the Starlite residence. The Startlite resident, Benjamin Talanca, 29, suffered a "severe laceration" head injury in the confrontation, police said and went to St. Joseph Health Center for treatment of his injuries, which are non-life-threatening. "He went to the back and tried to break in the window. He was coming and he got a pistol on him and after that, when I saw him, I started shooting. I shot him three times," says Nancer. I have a little difficulty understanding what happened. Did the criminal have a gun? Both men? 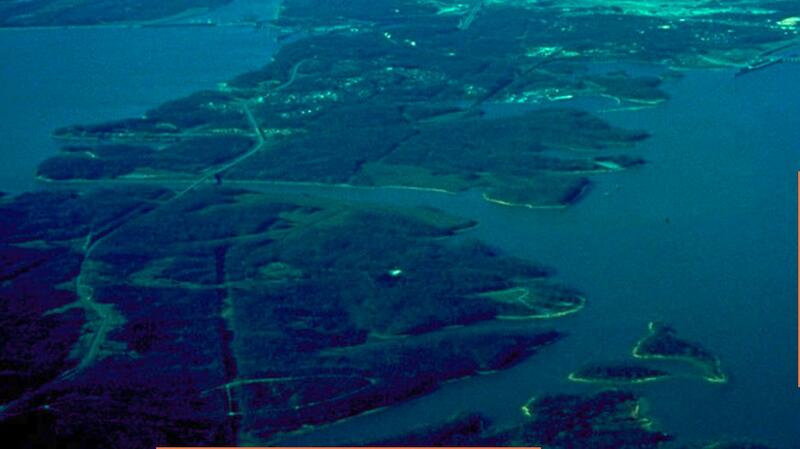 HAZELWOOD, Mo. (KMOV.com) – The victim of an attempted strong armed robbery detained a suspect who was attempting to rob him until police arrived at the scene in Hazelwood. Birmingham, Ala._A robbery suspect is at UAB Hospital after being shot by the person he's accused of trying to steal from. Excellent article by Dr. Steinmetz. Despite opposition from individual gun owners, Washington State sheriffs, the state’s Republican Party, and the National Rifle Association, Initiative 594 passed easily on Tuesday, November 4, by 59 percent to 41 percent, with Bloomberg's money promoting myths about it. This makes Washington the seventh state (along with the District of Columbia) to require universal background checks not only on all sales of firearms but on “transfers” as well, even between friends. Washington is the first state to pass such restrictions through a citizen-driven initiative. Largely unknown to voters, the complex 18-page initiative also greatly expands the state’s handgun registration program, with every sale or transfer of a handgun resulting in every party having his or her name entered into the state’s Department of Licensing database. One of the many myths circulated widely about the initiative was that it would keep criminals from obtaining firearms on the open market such as at gun shows. 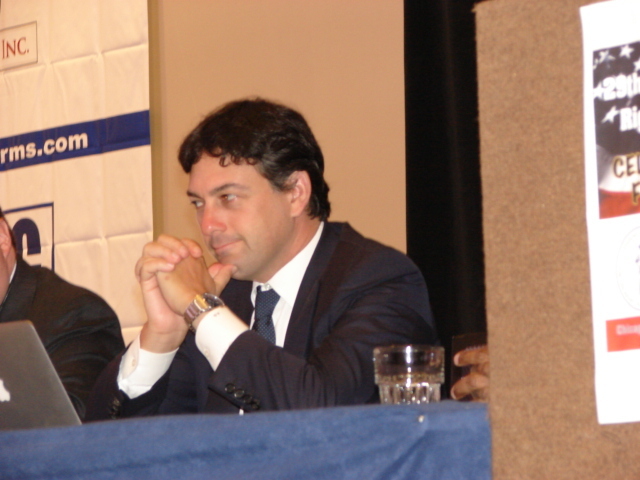 According to the Bureau of Justice Statistics, however, in a report issued in May, 2013, 77 percent of state prison inmates who are in jail for gun crimes acquired their weapons through “street” sources which included “theft or burglary,” drug dealers, and fences operating in the black or underground market. That i594 would have no effect in such acquisitions seemed to be lost on Washington State’s voters. 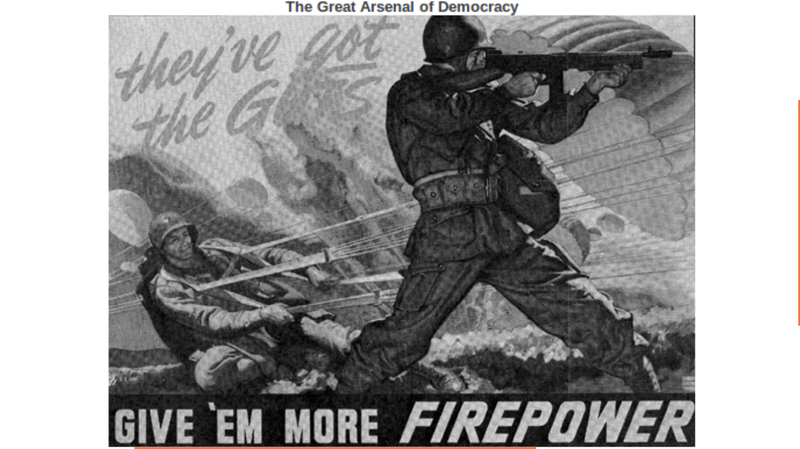 I'm sorry, but I read of these little 'victories' by the CalGuns Foundation in their thoroughly anti-gun state and cannot help but compare them to some WWII Japanese radio broadcast that exclaims that the Imperial Japanese Navy now has now deployed the first rocket-powered flying suicide bomb with which they shall lay waste to the American fleet off of Okinawa. I thought about it a bit, and it seemed his analogy was all wrong. The analogy might hold “water” if the kamakazi rocket planes had holed half of the carriers in the U.S fleet, and they were taking on water while the crews fought the fires. If Peruta stands, and odds are that it will, second amendment supporters win. 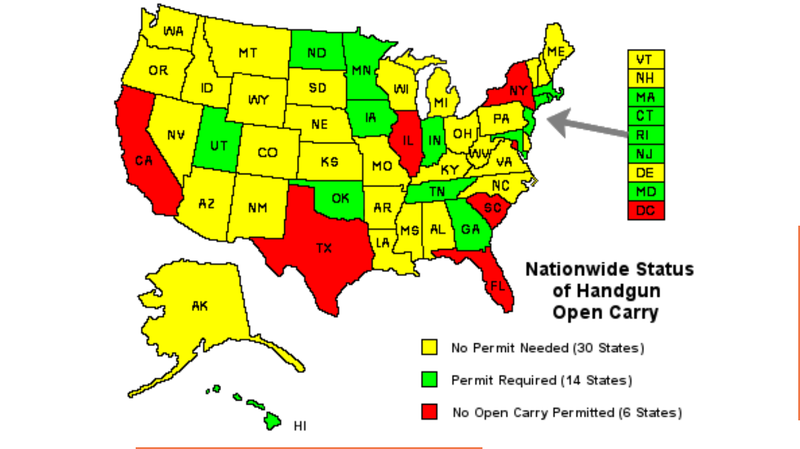 How do you stop concealed carry reciprocity across the nation when you have as your redoubt six little east coast states, and the entire rest of the country has shall issue or constitutional carry? I submit that the truth would be closer if the roles in the analogy were reversed. 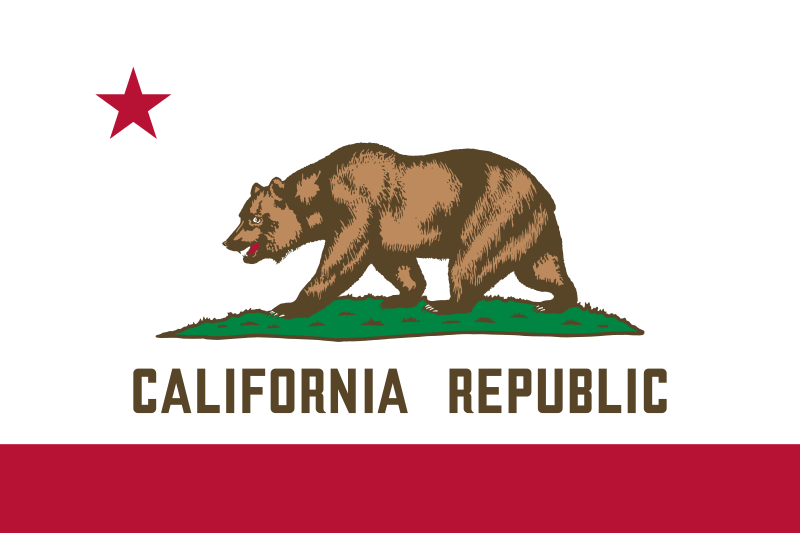 It is the Californian politicos that are fighting a desperate rearguard action. Heller was their Midway, and McDonald, MacArthur’s return to the Philippines. Concealed carry has been the Island hopping. Illinois was Okinawa. Peruta is a potential Hiroshima. Second amendment supporters just successfully “firebombed” Tokyo (DC) with the Palmer decision. I would not want to trade sides with the opposition. Second amendment supporters have the facts, logic, the culture, and the Constitution on their side. It is like the overwhelming advantage that the tremendous American production gave U.S. troops in the Pacific theater. In addition, second amendment fighters, those that pay attention and care, out number disarmists by somewhere in the neighborhood of 5 to one. Bloomberg is Benito Mussolini, Schumer is Emperor Hirohito, I will let you assign your own roll for the current president. It is a silly World War II analogy. The timing does not fit. Second Amendment supporters have been fighting the war for 50 years, 80, if you include the 1934 NFA. But it is fun to think of it that way. We are winning. 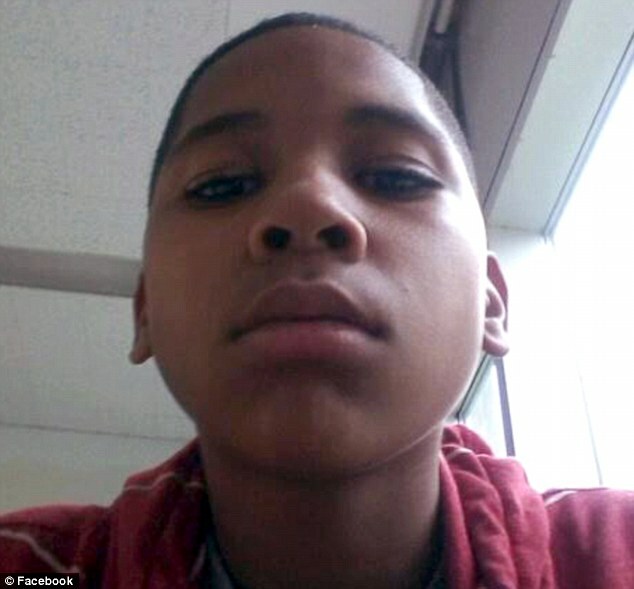 "Tamir, who was formally identified by officials on Sunday afternoon, was spotted 'waving around' the airsoft gun at a playground next to the Ohio recreation center at 3.30pm last Saturday. A concerned man, who was sitting nearby, called 911 and told the dispatcher: 'I’m sitting in the park…there’s a guy here with a pistol, and it’s probably a fake one, but he’s pointing it at everybody. Minutes later, two Cleveland Police officers - a rookie and a 10-15 year veteran - arrived at the scene. The rookie then asked the boy to put his hands up, at which point the youngster reached into his waistband and pulled out the pistol. Despite the 911 caller's prior warning that the gun was likely fake, the officer then fired two shots at Tamir, at least one of which hit him in the stomach, according to Cleveland.com. Police later told Fox 8 the weapon Tamir was carrying was 'an airsoft type replica gun resembling a semi-automatic pistol.' They added that the gun's orange safety indicator had been removed." 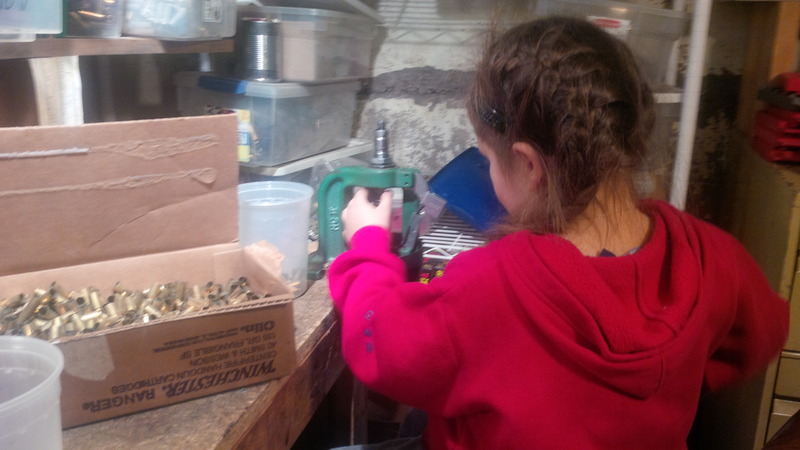 A reader sent this picture of his daughter assisting him in reloading cartridges. On a single stage press, such as the RCBS pictured, there is plenty to do. A young child can easily and safely deprime cases, such as this young girl is doing. She deprimed 500 of them for her father, and was very pleased with herself. It reminds me of pleasant times when my daughter was about five. She loved to help me reload ammunition. My own first experiences with reloading were when I was much older, perhaps eight, or nine. My father reloaded hunting ammunition for his model 99 .300 Savage. He was deadly with that rifle in the woods. I helped, or at least watched and handed over bullets. He used a Lyman 310 tool and an Ideal reloading manual. The 310 tool works just fine if you use the same rifle and do not have to full length resize the cases. We only loaded a couple of boxes at a time. 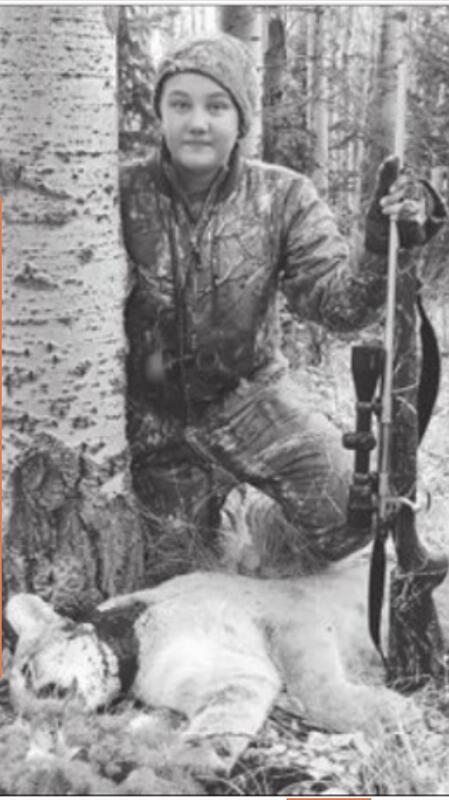 The rifle was not shot that much, mostly sighting in from a bench on our property a quarter mile away, across the Namekagon river, where there was a good backstop, and while hunting. More shots were fired in sighting in and in small amounts of practice, than were fired while hunting, even if my father routinely shot one or two deer a year. I shot my first deer with that rifle, at age 13. Reloading cartridges, and shooting a few of them, is an experience a child will remember forever. It imprints the brain with the possibilities of being productive and of having some control over the material world. I recall the experience as being empowering. It is a great building block for responsibility. To be trusted with real involvement in a powerful activity that requires responsibility, shows a child that they are loved, trusted, and respected. As fired cartridges contain small amounts of lead compounds, it is good safety practice to wash hands after a reloading session. OH: Armed Citizen Found not Guilty. Were Charges Political? 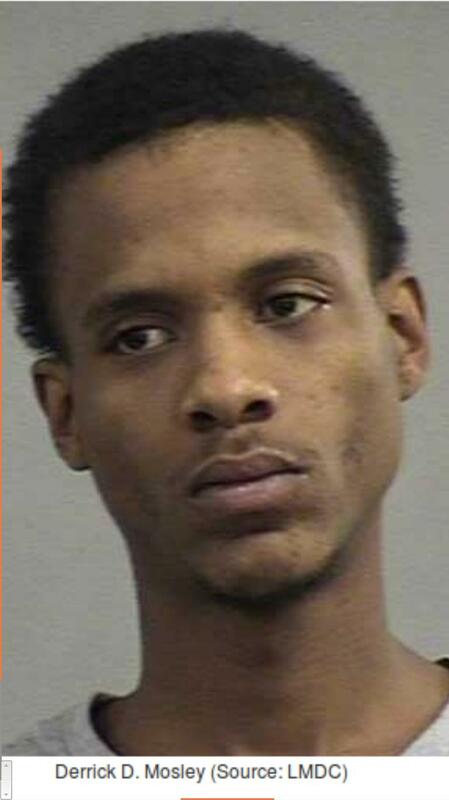 CINCINNATI —A man accused of shooting another driver in a road rage incident last year has been found not guilty on all charges. The judge said that Furr acted in self defense because Grissom was carrying a knife. I have not found much detail about this case. The news reports from Cincinnati are only giving the attacker's side of the story, referring to him as the "victim". Clearly, the judge and the police did not agree. It is not unusual for the real victim in these cases to be effectively gagged by the fact that they are facing charges, and their attorney has told them not to talk about the case. I suspect that the situation was very clear cut, but as we have seen with Michael Brown and Trayvon Martin, an attempt to learn the facts is handicapped by the way the system works. "Victims" can make incendiary charges, without any worry about repercussions. The accused can have anything he says used against him, so they must be very cautious. What is clear is that we do not have a detailed account of what happened when the "victim" was shot. The accusation simply seems to be "He was shot, therefore he is the victim." It is not clear if a jury was involved or not. It is a little unusual for a judge to make a statement such as the one above, so it may have been a trial without a jury. A person who is accused can waive their right to a jury trial, and many do, when they believe the facts are overwhelmingly in their favor. It would be nice to read the police reports written immediately after the event. They likely include statements from all of those involved. Columbus police say no charges have been filed in a Friday night shooting on the North Side that left a 49-year-old man dead. The shooter said he fired in self-defense. Columbus homicide detectives said that Paul V. Dixon II, 38, admitted to shooting Patterson but said it was in self-defense. Police said Dixon cooperated with authorities. A 74-year-old man trying to help his female neighbor shot another man in self-defense Friday when he came upon the woman’s apparent stalker. 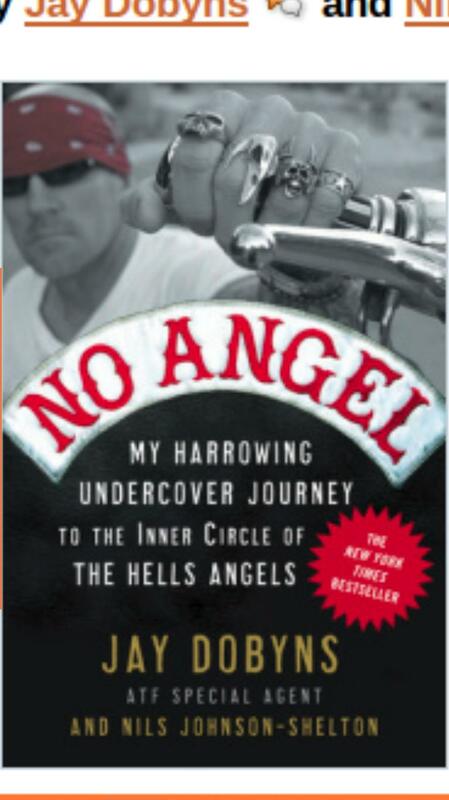 He was confronted by Miller, who told Green he had a knife and kicked him in the chest. Green then fired one shot into Miller’s foot with his licensed weapon. A knife was never located by deputies. Many people have made the observation that it is the weapon that you have with you that matters. A .22 that you have beats a .45 that you left at home. It is one of the reasons the tiny pocket .380s like the KelTec P3AT, the Taurus 738 and the Ruger LCP are so popular. Would things have turned out differently if she did not have her personal defensive firearm with her? Very likely. At the minimum, it is unlikely that the two criminals would have patiently waited for police to arrive. At worst, she could have been beaten, raped, or killed. That is all speculation, but you do not have to look far to find examples where it happened. Instead, we have the happy result of two more criminals having their career interrupted for some period of time. Women are the fastest growing segment of the gun culture. It has been reported that minority women benefit the most from the legal carry of guns. While Machiavelli wrote that quote before personal firearms had advanced to the point where Col. Colt had "made men and women equal", the meaning is clear, and just as valid today as it was in 1537. A mountain lion defense shooting has not been covered in the old media, at least not extensively. I have not found any other stories about the event other than that published in the 14 November, 2014 issue of the Lone Star Outdoor News. The Lone Star Outdoor News claims to be the "largest hunting and fishing newspaper in Texas". Alyssa said she had no idea the mountain lion was there until she was looking him in the face. 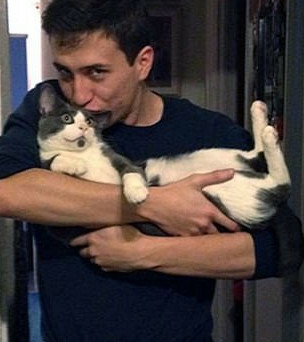 "I saw him first," Alyssa said. "I didn't hear him or see him until he was really close. I didn't know exactly what it was but I knew it wasn't a bobcat. 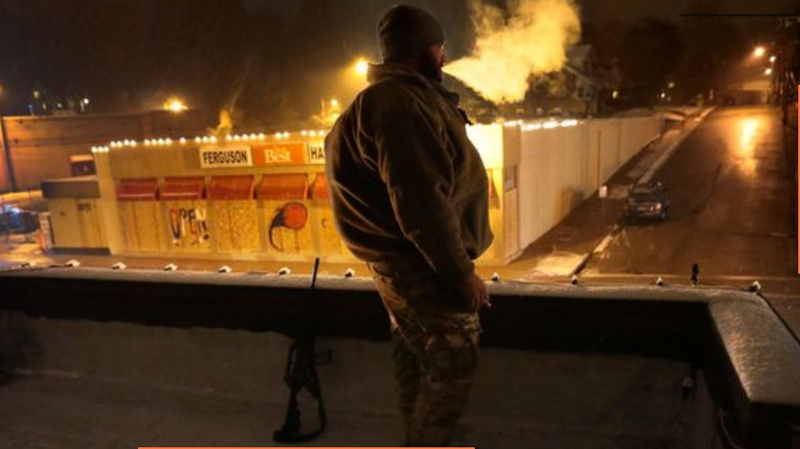 I raised my gun when he crouched down." Alyssa shot the cat at only 5 yards. She said that it was clear that the big cat was stalking her. While the place of the incident is not precisely mentioned in the article, it appears to have happened in New Mexico, near to the Colorado border. Alyssa continued on the hunt and two days later harvested a trophy bull elk. Update: I contacted the author of the article in the Lone Star Outdoor News, Conor Harrison. He confirmed that the event occurred in October of this year, 2014. One of the difficult things to quantify about defensive gun uses, is how often they occur without a shot being fired. The survey information indicates that it happens somewhere between a few hundred thousand to a few million times per year in the United States. With the Internet, we are becoming more aware of these events. Sometimes, they are reported in local media. It in the vast majority of cases, there is no report to police; if there is a police report, there is no media coverage; if there is media coverage, it is strictly local. I recall numerous students and friends telling me of incidents where they used a gun defensively without ever firing a shot. None of these incidents had any media coverage. The location was listed as near Wichita Falls, Texas. The problem, of course, is that people develop a false sense of reality. I have talked to many people who claim that self defense with a gun "never happens" because "I have never read about a singe case where it happened". This is how ideological editorial decisions (on the few cases that reach an editor's desk) misshape peoples' understanding of the world. Add to this the natural tendency to pay attention to blood and violence, while ignoring less dramatic defenses where no one is shot, and false impressions of the utility of firearms are created and furthered. "Every state that allows law-abiding students to carry guns on campus, every one of those schools has not had a mass shooting since they enacted that rule," Friday said. The case for campus carry is seldom allowed full presentation in the old media, but a fair presentation of the argument was given in the news4jax.com article. The article also includes a poll offering several options. Online polls are not scientific, but they do measure "intensity" fairly well. They measure the ratio of people for and against, who are willing to take the time to fill out an online poll. In the Florida campus carry poll, the results are outside of the norm. Most second amendment related polls show pro-rights support of from 3-10 to 1 in favor of more freedom. This online poll shows an astonishing 12 to 1 support for more freedom on campus! 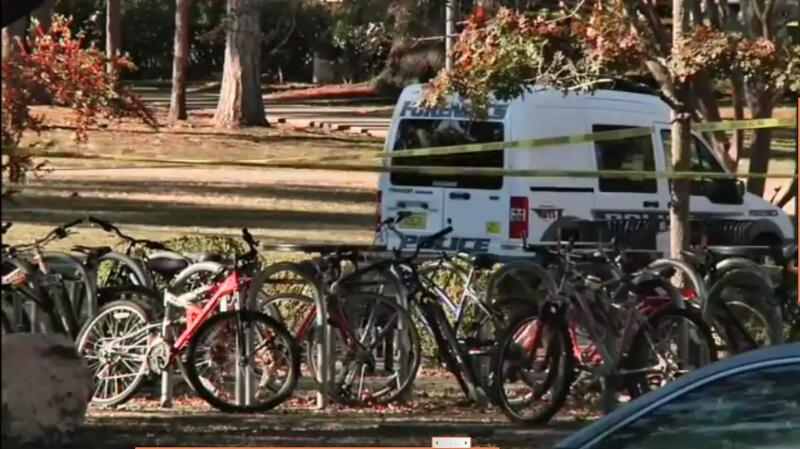 Would allowing guns on college campuses make students safer? Note that the status quo, that is, the current law, is the least popular, with only 1 percent of the votes. Coming right after a campus shooting, this is a very interesting result. Update: As of 18:00 MST, 24 November, 2014, the ratio is now nearly 15-1 in favor of more freedom on campus. This is the highest ratio that I have observed in a second amendment related poll. ANDERSON, SC (FOX Carolina) - Anderson County K-9s were assisting in the search for a person after a reported attempted breaking and entering. Deputies said a homeowner on the 1500 block of Big Creek Road fired a gun to scare off the person trying to break in on Thursday afternoon. At 2:30 p.m., K-9s were attempting to locate the person, who is described as between 25 and 35 years old, 5'9", 150 pounds and wearing a camouflage jacket. The victim's son, who wishes to remain anonymous, told FOX Carolina his dad's home had been robbed earlier in the week. Police are looking for a thief who ran from an Internet café after being shot at by a teller in downtown Salisbury Thursday night. Police said the suspect placed the gun on the counter while attempting to stuff the cash in his clothing. A man who was robbed of his iPhone shot the would-be robber in the chest Friday night in the city's Gentilly neighborhood, New Orleans police said. 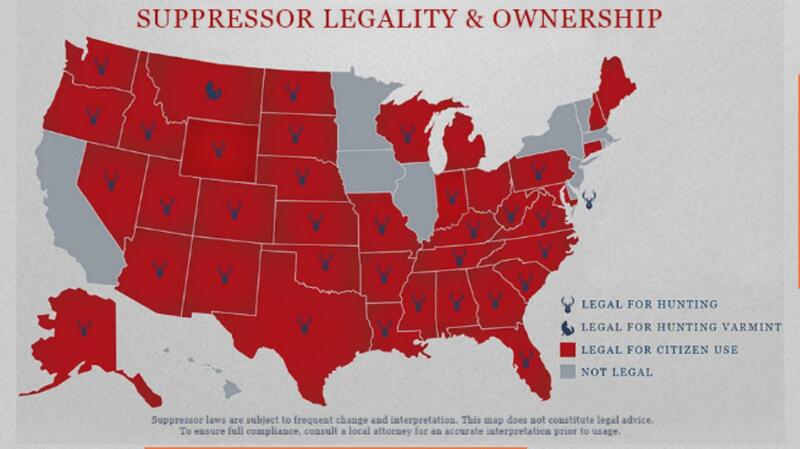 Map from American Suppressor Association. Using gun mufflers, sometimes referred to as suppressors or "silencers", has never been illegal in Florida. For some poorly documented reason, language was inserted into the Florida fish and game regulations in 1957, to make hunting with gun mufflers illegal. Today, 21 November, 2014, that language was removed. Now 33 states allow gun mufflers for all legal hunting. One state, Montana, only allows gun mufflers for hunting varmints. There are 11 states that do not allow ordinary citizens to own gun mufflers, and five that do not allow them for hunting. In Europe, gun mufflers are far less controlled than in the United States. In most countries, their use is considered to be good manners. ROSEVILLE, Calif., Nov. 20, 2014 /NEWS.GNOM.ES/ — California’s laws requiring gun purchasers to wait at least ten days before taking possession of their lawfully-acquired firearms are one step closer to being history, reports The Calguns Foundation, a gun rights group headquartered in the Sacramento suburb of Roseville. In a new order released today, Federal District Court Judge Anthony W. Ishii rejected two requests made by California Attorney General Kamala Harris in a dispute, captioned Silvester, et al. v. Harris, filed in Fresno nearly three years ago. The first coyote was recorded in New Hampshire in 1972. By 1980, they were found across the state. Eastern coyotes have wolf genes, and are larger than the western variety, reaching as much as 60 lbs. 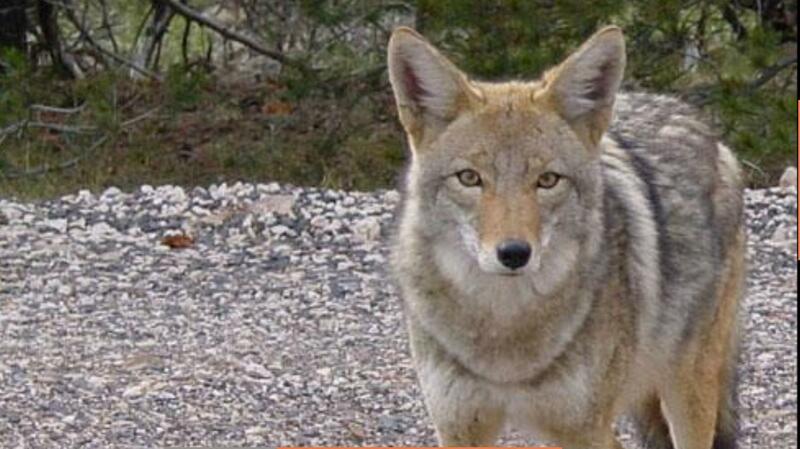 The boy’s dog ran away when the coyote approached which left the boy to fend off the coyote’s attack on his own. After repeatedly punching the coyote in the nose, the coyote eventually ran off leaving the boy scratched and potentially bitten. As a precautionary measure, the teen is undergoing a course of rabies shots intended to thwart the deadly viral infection. The woman involved in the Monday morning attack didn't want to be identified. Her 4-year-old dog, Mac, has too many wounds to count and is wearing a pain patch on his hind leg but was credited with fighting off the coyote. 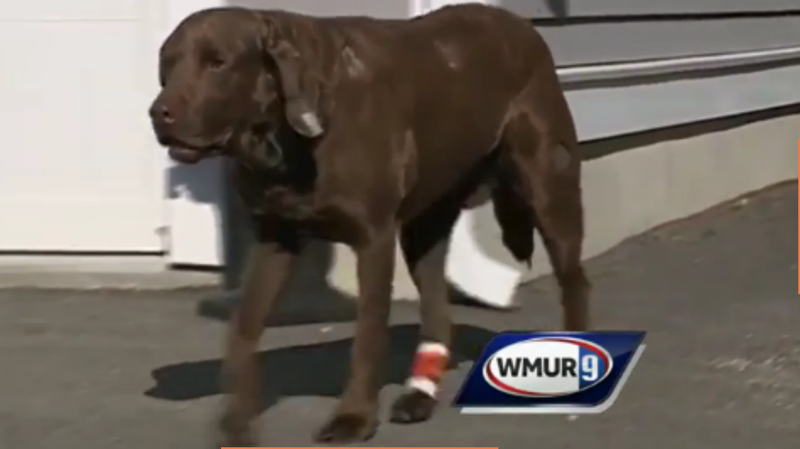 The woman and her dog were attacked while they were walking in a field on her property. Her husband heard her screams and drove his truck to separate them from the wild animal. "He fired off a couple of shots," said Police Chief Tara Laurent. "Not at the coyote, because it was near his wife, but he shot off a couple of rounds thinking it would scare the animal off, which is usually the case. And it didn't seem to faze the coyote in this particular case. The attack occurred in a rural area of fields and forest. No mention is made of the make, model, or caliber of the firearm used. The man and wife are undergoing rabies shots as a precautionary measure. Their dog, Mac the Coyote Fighter, is recovering. Officials say a Hyrum man who was shot and killed in his home last month was shot in self defense. Robert Van Hemert, 37, was shot and killed by his brother-in-law, 40-year-old Aaron Smith of Utah County, on Oct. 14 after an argument between them. ALBUQUERQUE, N.M. —The attorney general's office says no charges will be filed in the March 2013 fatal shooting of an Iraq War veteran. Investigators say Jonathan Mitchell, 23, was shot and killed near his northwest Albuquerque home by a neighbor named Donnie Pearson. Distance is your friend in a gunfight. The good guys do not always win. “I see the guy reach in his pockets. I say ‘Abdullah, he is getting his gun.’ Abdullah pulls his gun at the same time as that guy, he shoots, Abdullah gets a shot off,” Hamayel said. She said Mahdi suffered a head wound in the exchange, while McDonald was hit in the stomach. She said McDonald continued shooting as she hit the floor. Ironically, Sana said Mahdi, who died from his wounds a few hours after the shooting, would have given McDonald anything he wanted if he had asked. “He is the most pure man you can ever be around. He can’t stop helping people. And it hurts him not to be able to do anything for anyone,” Hamayel said. At last check, McDonald was being treated at St. Elizabeth Health Center in Youngstown. The victim was asleep in his home shortly after 2:45 a.m. when he heard loud banging and glass breaking at the front of his house. He grabbed his gun and looked outside but didn't see anyone. According to the charging documents, the victim went to the backdoor when he heard another window breaking and saw 18-year-old Jimmy Harding attempting to kick in the door to the detached building the victim uses as his shop. The victim was backing toward deputies and unloading his gun when Harding reportedly stood up suddenly and charged at him. One of the deputies punched Harding in the face, and he fell onto the victim's porch. According to the charging documents, deputies punched Harding multiple times in the ribs and used a Taser on him before they were able to get him into handcuffs and seated in the back of a patrol car. "The victim, luckily he had protection. He had his firearm," Det. Thompson says. "Once they realized he was about to reach for his gun, they fled the scene. " Detectives are talking to the victim now to learn more about what happened. Police say he is being cooperative, and they hope to track down his two attackers as soon as possible. 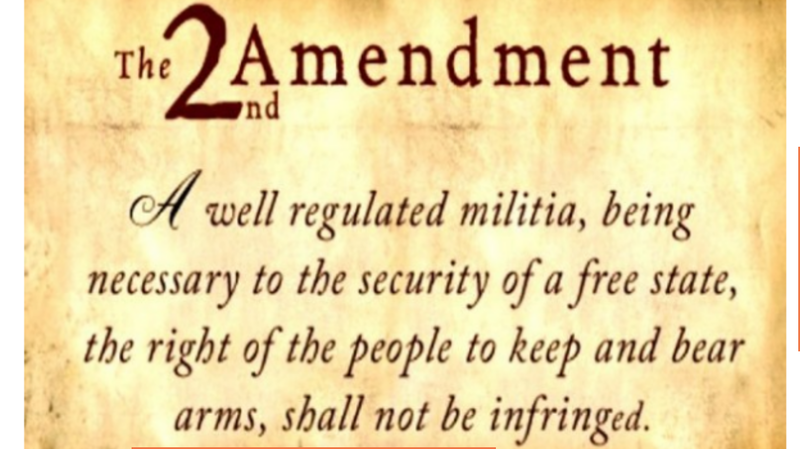 In the ongoing legal battle by Alan Gura to force the District of Columbia City Council to respect the second amendment of the Constitution, a request that the City government be held in contempt was file on Tuesday, the 18th of November, 2014. It seems to come as a response to the city claiming that the Court lacked jurisdiction, because no request for a finding of contempt was fired. This matter came before the Court on Plaintiffs’ motion to hold Defendants in contempt. Defendants are hereby ORDERED TO SHOW CAUSE, by ____________, 2014, why they should not be held in contempt for violating this Court’s injunction entered July 26, 2014. Both parties are therefore to present arguments about whether Judge Scullin should issue an order asking the DC city government why they should not be held in contempt. Actual lawyers, feel free to enlighten us as to what this likely means.